UC CubeCats President Himadri Pandey holds a model of a cubesat in the club's lab. If NASA wants to go to Mars, it needs a material that can protect astronauts from radiation during the long trip. A student group from the University of Cincinnati is looking to help. The UC CubeCats are creating a Rubik's Cube-sized satellite that will test if a thin carbon sheeting can block radiation effectively. "NASA's done a lot of research on this," says fourth year Mechanical Engineering major Reeve Lambert. "But all the research that's been done has been done on the ground, whether it be with nuclear reactors or creating radiation to study this. This hasn't been studied in an actual space environment, which is what we're trying to do." The research is important because it could lead to lighter spacecraft and allow for long-term space flights, like to Mars, or space habitats. The group got the idea for what they're calling Project Leopard by thinking about what NASA needs. "As we brainstormed and narrowed down our selections, we came down to the need for an effective, lightweight, radiation-mitigating material." NASA's CubeSat Launch Initiative aims to open space research to schools and non-profits. According to the space agency, CubeSats are "cube-shaped satellites" that are typically up to "about 10 cm x 10 cm x 10 cm and typically weigh less than 1.33 kg." 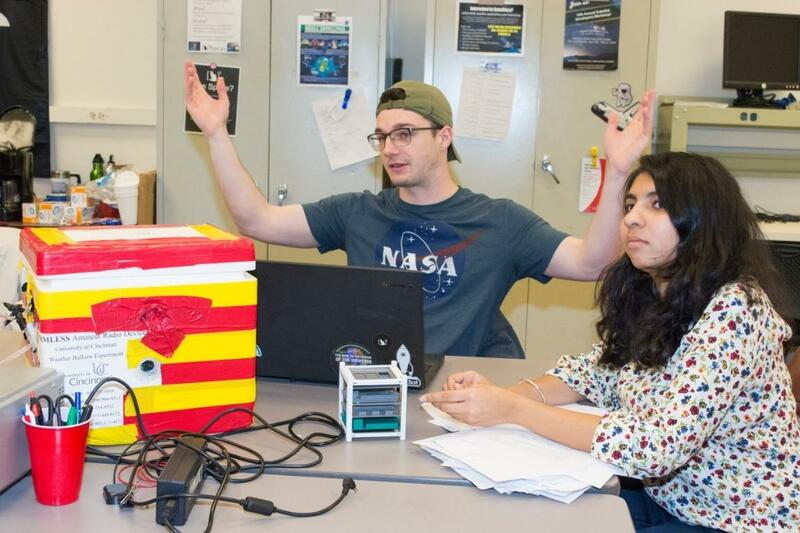 UC CubeCats founder Adam Herrmann, left, and President Himadri Pandey talk about the many space projects they considered before choosing to study radiation in space. If selected, Lambert estimates the project would lift off sometime in the next two years, well after he and several other club members graduate. "It's sort of a bag of mixed emotions," he says. "Part of it is to develop this organization and to build this satellite from the ground up. It's a very high learning process and creates an opportunity for a lot of people and is very rewarding." He likes the idea of passing along everything he's worked for and learned, "but it is sad that a lot of us will be graduating before the project can actually go into space."